After months of trying to decide whether installing a third-party regulator was a good idea, I took the plunge and got myself a Robert Lane reg for my Air Arms S510 Ultimate Sporter. I love this rifle, but it has a pretty disappointing bell curve. I have always wanted to install a regulator but had to consider a) the cost, and b) the implications of drilling a vent hole in the air cylinder (there’s no going back, in other words). I had a chat with Robert in the UK (That man is like a fountain of knowledge…stand around and LEARN!) and decided the advantages WAY outweighed the disadvantages. Here are some pictures of the installation process – And the results. The Lane regulator seems extremely well built and came with plenty of spare parts. Screw on top adjusts regulated pressure. I decided to use a lathe and a drill press…as opposed to a hand drill and a hacksaw. This is expensive stuff we’re dealing with here! This photo shows the location of the vent hole. The vent hole needs to be located between the two outer o-rings on the regulator to allow it to “breathe”. Drill your hole in the wrong place, and you have a problem! The air pot needed to be cut shorter so that the regulator could be fitted in the correct position. The air pot being shortened on the lathe. The lane regulator kit includes the correct size drill bit for the vent hole. The hole needs to be de-burred on the inside to prevent the o-rings of the reg being damaged. These are my initial results with NO additional adjustments to the hammer, valve or transfer port. As you can see, the regulator is set to 135 Bar – All shots above 135 Bar are very consistent, and after 135 Bar the regulator cuts out and the shot strings look exactly the same. 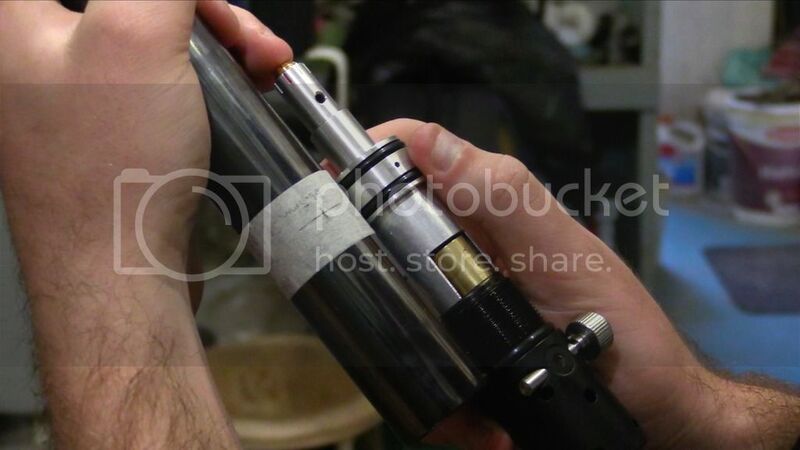 Note that I am filling to 250 Bar – The Air Arms cylinders can hold pressure way over 250, but “max fill pressure 200 bar” is printed on the cylinder because when unregulated, the valve cannot operate correctly above 200 Bar. And here’s what the graph looks like when I only include shots within an extreme spread of 20 fps. The difference in shot count is insane – 52 shots as opposed to 18, and I only lose one or two foot pounds of energy. Lastly, here’s a photo of the Ultimate Sporter (bottom). I intend to modify the hammer by lightening it a little (drilling holes in the hammer, fitting grub screws in the holes and adding/removing grub screws to modify the weight). Preferably, I would want this rifle to shoot at around 900 fps with 18gr JSBs – With an anti-bounce hammer and some more fine tuning I would like to see a shot count of around 70. That would put a smile on my face, as this really is a beautiful rifle that deserves to be used more often! After months of trying to decide whether installing a third-party regulator was a good idea, I took the plunge and got myself a Robert Lane reg for my Air Arms S510 Ultimate Sporter. I love this rifle, but it has a pretty disappointing bell curve. I have always wanted to install a regulator but had to consider a) the cost, and b) the implications of drilling a vent hole in the air cylinder (there's no going back, in other words). I had a chat with Robert in the UK (That man is like a fountain of knowledge...stand around and LEARN!) and decided the advantages WAY outweighed the disadvantages. Here are some pictures of the installation process - And the results. The Lane regulator seems extremely well built and came with plenty of spare parts. Screw on top adjusts regulated pressure. I decided to use a lathe and a drill press...as opposed to a hand drill and a hacksaw. This is expensive stuff we're dealing with here! This photo shows the location of the vent hole. The vent hole needs to be located between the two outer o-rings on the regulator to allow it to "breathe". Drill your hole in the wrong place, and you have a problem! The air pot needed to be cut shorter so that the regulator could be fitted in the correct position. 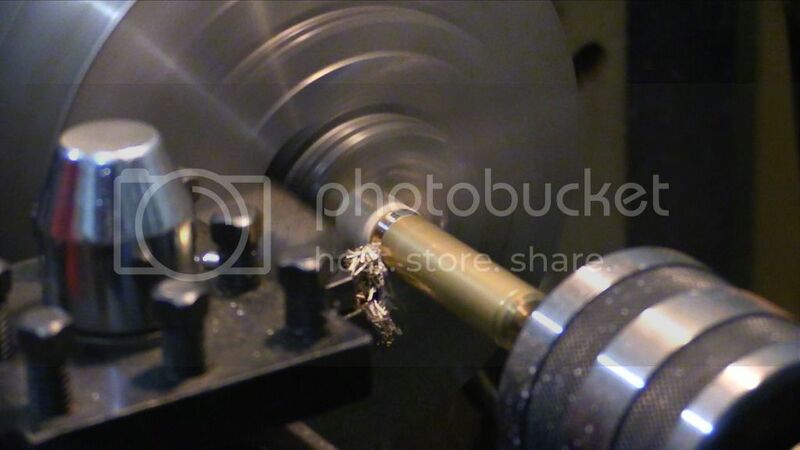 The air pot being shortened on the lathe. The lane regulator kit includes the correct size drill bit for the vent hole. The hole needs to be de-burred on the inside to prevent the o-rings of the reg being damaged. These are my initial results with NO additional adjustments to the hammer, valve or transfer port. 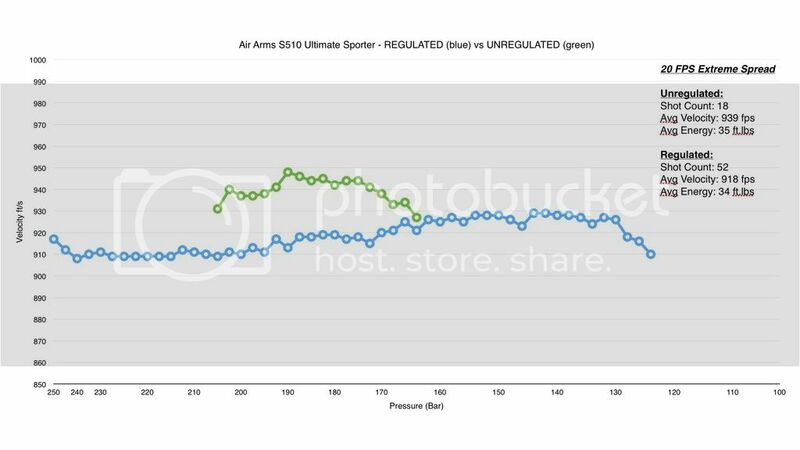 As you can see, the regulator is set to 135 Bar - All shots above 135 Bar are very consistent, and after 135 Bar the regulator cuts out and the shot strings look exactly the same. Note that I am filling to 250 Bar - The Air Arms cylinders can hold pressure way over 250, but "max fill pressure 200 bar" is printed on the cylinder because when unregulated, the valve cannot operate correctly above 200 Bar. And here's what the graph looks like when I only include shots within an extreme spread of 20 fps. The difference in shot count is insane - 52 shots as opposed to 18, and I only lose one or two foot pounds of energy. Lastly, here's a photo of the Ultimate Sporter (bottom). I intend to modify the hammer by lightening it a little (drilling holes in the hammer, fitting grub screws in the holes and adding/removing grub screws to modify the weight). Preferably, I would want this rifle to shoot at around 900 fps with 18gr JSBs - With an anti-bounce hammer and some more fine tuning I would like to see a shot count of around 70. That would put a smile on my face, as this really is a beautiful rifle that deserves to be used more often! Thanks Matt, Very interesting results, I think it I’m going to look into this. Are the mark and notches at the top of the regulator already pre-set or do you have to figure it out on your own? if you don’t mind me asking, what does the regulator sell for? Is there a website to look up on or to get more info? nice documentation! I’d say just put the reg pressure at 120 bar and be done with it! At that pressure you’d be at 900 fps with the 18 grain jsb’s and propably get around 55-60 shots from a 250 bar fill. Hi Matt nice documentation! I'd say just put the reg pressure at 120 bar and be done with it! At that pressure you'd be at 900 fps with the 18 grain jsb's and propably get around 55-60 shots from a 250 bar fill. Am rather interested in graph results. Have you re-tested pellet speed consistency to see whether variances are still same? Did you shorten the valve return spring before re-inserting into the brass housing (pot) you shortened? If so, by how much? Do you know the diameter of the hole in the end (nearest regulator) of the shortened brass housing (air intake of pot)? Am rather interested in graph results. Have you re-tested pellet speed consistency to see whether variances are still same? Did you shorten the valve return spring before re-inserting into the brass housing (pot) you shortened? If so, by how much? 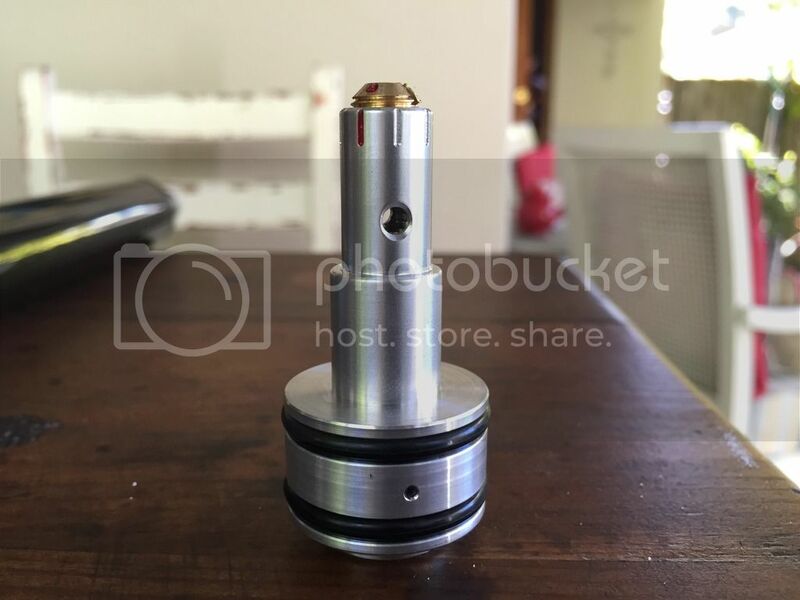 Do you know the diameter of the hole in the end (nearest regulator) of the shortened brass housing (air intake of pot)? Matt – Very nice write up and pictures. I enjoy quality post like this. Thank you for sharing. Matt - Very nice write up and pictures. I enjoy quality post like this. Thank you for sharing. Nice work!! This is just plain excellent, Matt – both the results and your narration/photos! These are the kind of posts that incite change. This is just plain excellent, Matt - both the results and your narration/photos! These are the kind of posts that incite change. I just recently ran my AA-S510 over the chrony and it showed almost exactly the same bell curve. I’m in the same boat you were just in before you ordered your reg. Unlike you, I do not have a metal lathe or fine metal working skills. Excellent post! Thanks for sharing. I just recently ran my AA-S510 over the chrony and it showed almost exactly the same bell curve. I'm in the same boat you were just in before you ordered your reg. Unlike you, I do not have a metal lathe or fine metal working skills. Good looking rifle too! In order to install a Lane regulator you normally just need a hand drill, though sometimes (such as with S510) a couple of basic tools anyone would have in their garage. You don’t need a drill press or lathe. The regulators are marked with notches and you are given a guide as to where to set it with a screwdriver, though Rob uses the general ideal setting for your calibre/power level. Each person, depending upon their requirements, can fine tune it to maximise efficiency etc. Lots of sheets/guidance given, and an encyclopaedic knowledge and helpful expert is on the other end of the phone….Rob Lane. Lots of helpful and surprising videos on YouTube. Are the notches on the top of the regulator already pre-set or do you have to figure it out on your own? When you order the regulator you can choose whatever pressure you want, and they set it for you before sending it. I believe each notch marks 5 Bar, allowing you to change the regulated pressure very easily with a screwdriver. The reg sells for about S120 from airgunregulators.com and that price includes shipping to anywhere in the world. I thought of doing this…It would be the easiest way to get the velocity down a little, but apparently because the hammer & valve are optimised for a higher fill pressure, air would be wasted because the valve would be open for an unnecessary amount of time. In other words I’ll get the velocity where I want it, but might not save any more air. 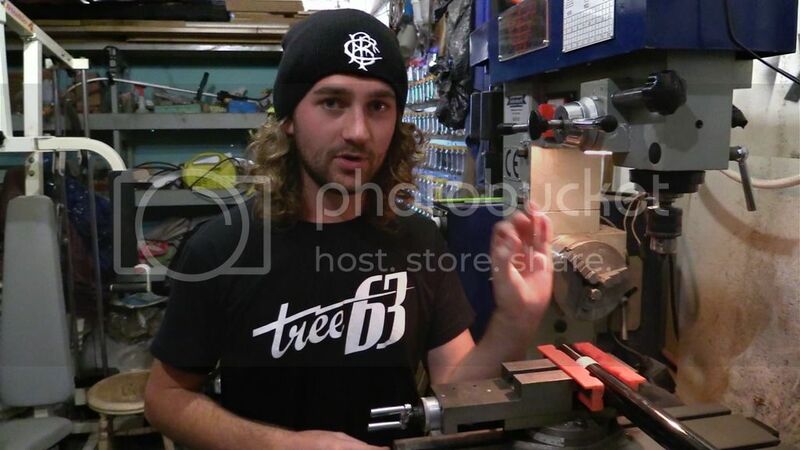 Robert suggested 135 Bar and said that fine adjustments (20 fps up or down) should be done on the hammer and valve. You may be totally right, but that’s what I understand so far. This is all pretty new to me still! "RC-NL"Hi Matt nice documentation! I'd say just put the reg pressure at 120 bar and be done with it! At that pressure you'd be at 900 fps with the 18 grain jsb's and propably get around 55-60 shots from a 250 bar fill. I thought of doing this...It would be the easiest way to get the velocity down a little, but apparently because the hammer & valve are optimised for a higher fill pressure, air would be wasted because the valve would be open for an unnecessary amount of time. In other words I'll get the velocity where I want it, but might not save any more air. Robert suggested 135 Bar and said that fine adjustments (20 fps up or down) should be done on the hammer and valve. You may be totally right, but that's what I understand so far. This is all pretty new to me still! “Cookie”Am rather interested in graph results. -I haven’t re-tested anything yet. These were my initial results, but I plan to re-test once I’ve put a few hundred shots through the gun. -I didn’t shorten the valve return spring at all. The pot was cut behind the spring retaining step and I left the spring exactly how it was. -I don’t know the exact diameter of the hole in the pot, but I’m guessing it was probably around 7-10mm – Very large. "Cookie"Am rather interested in graph results. Have you re-tested pellet speed consistency to see whether variances are still same? Did you shorten the valve return spring before re-inserting into the brass housing (pot) you shortened? If so, by how much? 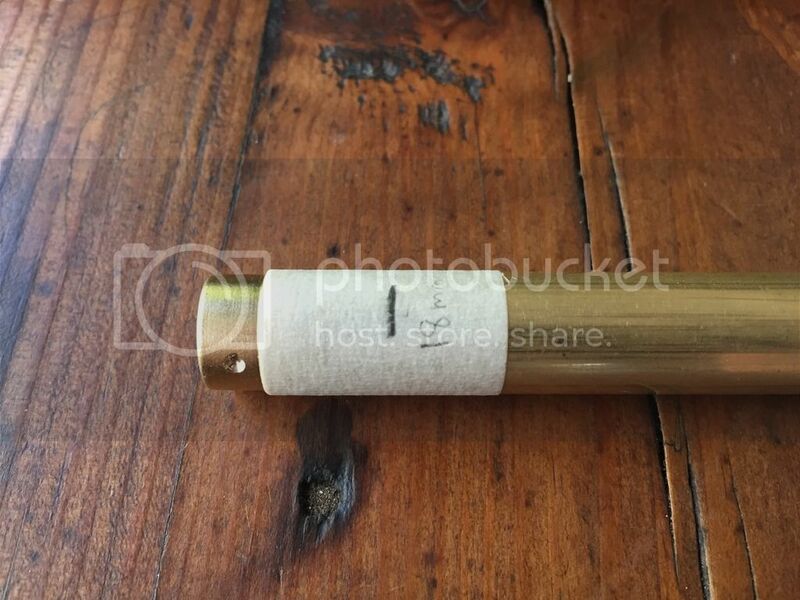 Do you know the diameter of the hole in the end (nearest regulator) of the shortened brass housing (air intake of pot)? “Tominco”Excellent post! Thanks for sharing. I was pretty terrified at the thought of making permanent modifications to my gun, but it wasn’t nearly as difficult as I thought it would be. "Tominco"Excellent post! Thanks for sharing. I just recently ran my AA-S510 over the chrony and it showed almost exactly the same bell curve. I'm in the same boat you were just in before you ordered your reg. Unlike you, I do not have a metal lathe or fine metal working skills. Good looking rifle too! Why don’t all guns include regulators as standard? Seems like a no-brainer. What’s the drawback? Why don't all guns include regulators as standard? Seems like a no-brainer. What's the drawback? Matt, if and when you decide to modify the hammer weight would you please share in the same detail what your doing there? I’ve seen the initial install of the regulator on various forums and Youtube videos but the hammer mods are hard to come by.Thanks for the post. “ztirffritz”Why don’t all guns include regulators as standard? Seems like a no-brainer. What’s the drawback? Some folks prefer less complexity, lower cost and more reliability to consistent shot to shot FPS. Sooner or later the orings on the regulator will go, which will require the gun be taken apart. Some folks just don’t want to deal with that and so not having another part to maintain is a plus to them. I prefer a regulator in my guns and most of them have one. "ztirffritz"Why don't all guns include regulators as standard? Seems like a no-brainer. What's the drawback? Some folks prefer less complexity, lower cost and more reliability to consistent shot to shot FPS. Sooner or later the orings on the regulator will go, which will require the gun be taken apart. Some folks just don't want to deal with that and so not having another part to maintain is a plus to them. I prefer a regulator in my guns and most of them have one. “jking”Matt, if and when you decide to modify the hammer weight would you please share in the same detail what your doing there? I’ve seen the initial install of the regulator on various forums and Youtube videos but the hammer mods are hard to come by.Thanks for the post. I will certainly do that. I am already making a long video of the installation process and testing. I will either modify the hammer myself or order an anti-bounce kit and adjust the regulator. Apparently the anti-bounce hammer makes a HUGE difference. You originally stated that the valve cannot operate correctly above 200bar but if the valve you refer to is that that has its poppet/stem hit by the hammer upon firing then I point out that the only shot results that mirror my own experiences with Lane regulators are the shot results between 240 to 200 bar; the remaining variances and style of results not reflective of such a regulator. However, due to a regulator (set at 135 bar) being in the way, it cannot be the case that the valve is regulated by pressured above 200 bar. I’m wondering how such results can occur. I had a concern that the “pot” end hole wasn’t of sufficient size to permit correct airflow and that it, together with valve return spring pressure, was somehow the cause of the results below 200 bar. That is why I asked the question about the valve return spring and “pot”. I’m approaching the matter from a different perspective than you, but personally I would simply follow the tests Robert Lane’s instructions state that shooters perform initially, then shoot the rifle for 200 pellets or so then chrony test again before consider any further modifications. Assuming battery and lighting are ok for the chrony, and that power adjuster isn’t moved; If the results don’t flatten out or show an ever so slight decline, then I’d send chrony figures to Robert for his experienced opinion on which direction to follow….which may be excessive hammer spring tension. Alternatively, you could try and get Robert to come on here and blow people away with his knowledge. Thanks for the response. You originally stated that the valve cannot operate correctly above 200bar but if the valve you refer to is that that has its poppet/stem hit by the hammer upon firing then I point out that the only shot results that mirror my own experiences with Lane regulators are the shot results between 240 to 200 bar; the remaining variances and style of results not reflective of such a regulator. However, due to a regulator (set at 135 bar) being in the way, it cannot be the case that the valve is regulated by pressured above 200 bar. I’m wondering how such results can occur. I had a concern that the “pot” end hole wasn’t of sufficient size to permit correct airflow and that it, together with valve return spring pressure, was somehow the cause of the results below 200 bar. That is why I asked the question about the valve return spring and “pot”. I’m approaching the matter from a different perspective than you, but personally I would simply follow the tests Robert Lane’s instructions state that shooters perform initially, then shoot the rifle for 200 pellets or so then chrony test again before consider any further modifications. Assuming battery and lighting are ok for the chrony, and that power adjuster isn’t moved; If the results don’t flatten out or show an ever so slight decline, then I’d send chrony figures to Robert for his experienced opinion on which direction to follow….which may be excessive hammer spring tension. Alternatively, you could try and get Robert to come on here and blow people away with his knowledge. Thanks for your input Cookie. I also thought the results seemed a little odd. I doubt the air pot is the problem – The end of the pot (behind the spring retaining step) is completely open so it shouldn’t have any influence. I will send the initial results to Robert and hear his opinion, and I’ll also re-test after a few hundred shots to see if anything’s settled. Perhaps my results will be different the second time. It would be great to have Robert on the forum. I’m sure we could all learn a thing or two from his experience! I will send him a link to this thread and see if I can persuade him to join. "Cookie"Thanks for the response. You originally stated that the valve cannot operate correctly above 200bar but if the valve you refer to is that that has its poppet/stem hit by the hammer upon firing then I point out that the only shot results that mirror my own experiences with Lane regulators are the shot results between 240 to 200 bar; the remaining variances and style of results not reflective of such a regulator. However, due to a regulator (set at 135 bar) being in the way, it cannot be the case that the valve is regulated by pressured above 200 bar. I’m wondering how such results can occur. 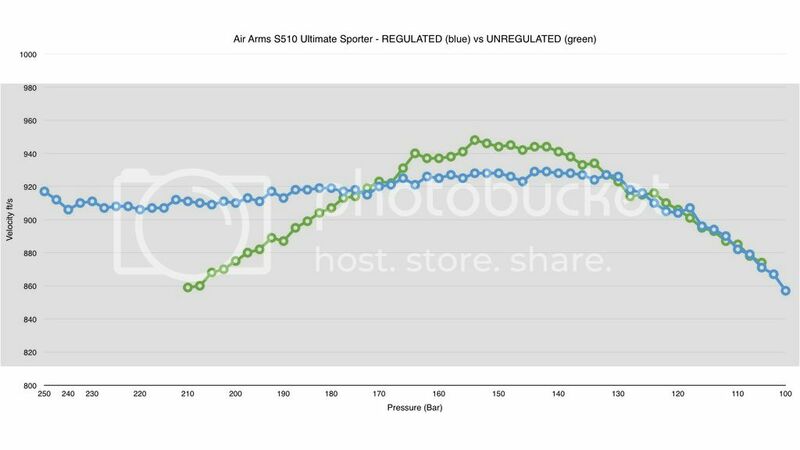 I had a concern that the “pot” end hole wasn’t of sufficient size to permit correct airflow and that it, together with valve return spring pressure, was somehow the cause of the results below 200 bar. That is why I asked the question about the valve return spring and “pot”. I’m approaching the matter from a different perspective than you, but personally I would simply follow the tests Robert Lane’s instructions state that shooters perform initially, then shoot the rifle for 200 pellets or so then chrony test again before consider any further modifications. Assuming battery and lighting are ok for the chrony, and that power adjuster isn’t moved; If the results don’t flatten out or show an ever so slight decline, then I’d send chrony figures to Robert for his experienced opinion on which direction to follow….which may be excessive hammer spring tension. Alternatively, you could try and get Robert to come on here and blow people away with his knowledge.